Thanks, and a special thanks to the two gents that put the patio up. Real troopers working in this HEAT. Very nice, cordial - worked their butts off. -Thanks again! It was a pleasure working with you on our pergola project. On all points you were clear, professional, and timely. We are thrilled with the project and you.-Thank you so much! Thank you very much for a beautiful patio. I am not easily pleased and I am ecstatic!!!! I love it. Teo worked out really well too. - Patti and Don F.
Thanks for everything! The patio cover looks great and really added to the look of the yard as well as providing a little bit of shade cover. Glad we opted for the "latte" colors too. I appreciate the great work from you and your crew and will certainly pass along any referrals to you and AZ Sun Control! Thanks again! - Michael & Cheryl A. When have you ever been able to say you were completely happy with a contractor? It just doesn't happen much in the real world. Working with Arizona Sun Control was actually a pleasure - the guys were great, the process was painless, and the results are amazing. 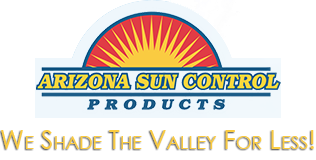 I'm usually hesitant to endorse anything, but in the case of Arizona Sun Control, I really believe these guys do right by their customers. We want to thank you for the quality job you did on our patio cover. It was a big job and you were very open to our questions and suggestions. Everybody involved was very professional and communicative. We were able to come to a financial agreement that both parties were happy with. The actual work was done in a very timely fashion. We would highly recommend Arizona Sun Control. We chose Arizona Sun Control because their pricing was the most affordable... but now we know that their quality is also the best in the Valley! When I have guests they always marvel at my retractable awnings. They are even more surprised when I tell them how much I paid. The beauty and functionality of the awnings are simply incredible! I was amazed by the hands-on customer service I received with Arizona Sun Control. I would highly recommend them to anyone considering roll-down shades.